Major League Baseball still has almost two months before the World Series will decide the next World Champion. The single most outstanding player may even become known as Mr. October for leading his team to victory. Here on Cape Cod, guests who stay at our Sandwich Bed and Breakfast have an opportunity to see the real "boys of summer", the college athletes that play in the Cape Cod Baseball League (CCBL). The league just wrapped up their season with the Harwich Mariners defeating the Falmouth Commodores for the 2011 Cape League Championship. As the wooden bats are stowed, the concession stands boarded up, and hundreds of volunteers and fans look forward to next year, another great summer of baseball comes to a close. For the Cape League, this was its 126 season since its' founding in 1885. The league attracts the best of the today’s college players who are destined to become the major league baseball stars of tomorrow. In 2010, 217 CCBL alumni were playing in the majors or one in seven of the current major league players spent time honing their skills on Cape Cod. The ten Cape Cod Baseball League teams cover the Cape, making it easy for visitors to catch a game almost every night of the summer. Teams are located in Bourne, Brewster, Chatham, Cotuit, Falmouth, Harwich, Hyannis, Orleans, Wareham, and Yarmouth-Dennis. The Bourne Braves play at the new Doran Park, just six miles from our Sandwich Bed and Breakfast. If you are a baseball fan, consider the great baseball you can see when you come and stay on Cape Cod. As you plan your next summers vacation, check out the 2012 Cape Cod Baseball League schedule. If you stay with us, I’ll take you to cheer for my Bourne Braves who finished out of the money this year but, as in all sports, there is always next year. Sandwich’s history is prominent in the Sandwich Heritage Trail which features ten exceptional museums and historical sites that we are proud to share with guest from around the world who come to stay at our Cape Cod bed and breakfast. 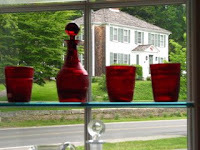 For years Sandwich, MA was known as the Museum Town, for the likes of the Heritage Plantation, Glass Museum, Doll Museum, etc. Today, we promote our key historical and geographic pedigree and the Sandwich Chamber modestly proclaims that ‘Cape Cod begins here’. This positioning statement of fact recognizes Sandwich, incorporated in 1637, as the oldest town on Cape Cod and that Sandwich is literally the first ground that 100s of thousands of visitors touch annually as they cross the Sagamore Bridge, leaving the mainland behind. We are happily located in the historic Town Hall Square and across the street from the Sandwich Glass Museum. This museum was established in 1907 as the Sandwich Historical Society with a mission defined as “collects, preserves and interprets the history of the Town of Sandwich”. In addition to being the oldest town on Cape Cod, a large part of Sandwich history is involved with American glass production. Sandwich was the world center of pressed glass production in the mid-1800s and the Sandwich Glass Museum is the major repository of the highly collectable Sandwich glass. We arrived in Sandwich in 2003, just in time for the dedication of the then brand new museum expansion that "Relight the fires in Sandwich" with a fully functional glass furnace where visitors see daily entertaining glassblowing demonstrations. 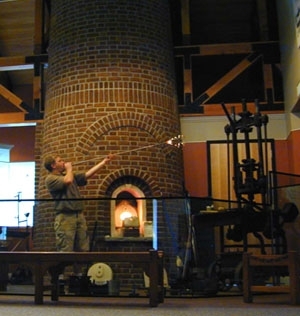 Guests at our inn enjoy seeing the art of glassblowing and the historical exhibits that show the output of the long gone massive factory that dominated Sandwich during the 1800s. The Sandwich Glass Museum is not a dusty and stagnant accumulation of the past. Its special exhibits and events create a fascinating, continuously changing look at art as expressed in the medium of glass. I attend the opening reception of the new exhibit of Ricky Bernstein’s Kitchen Dreams. I was overwhelmed by the innovation and scale of his work and fully agreed with the invitations statement of ‘Ricky’s larger than life wall relief sculptures will astound and amuse even the most serious’. 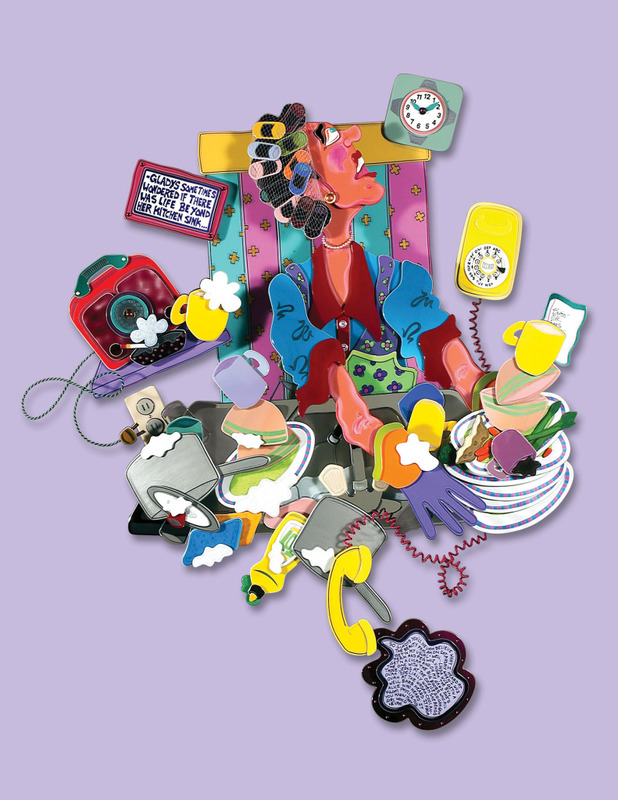 Mr. Bernstein is a nationally acclaimed artist and sculptor whose collage-style glass and aluminum wall reliefs tell a story with a decided pop-art flavor. They are not only colorful and masterfully created; they uniquely feature a slice of Americana. Originally from Providence, RI, his work is featured in galleries and museums nationally and internationally. This exhibit runs through October 30, 2011 and is just one more reason we encourage all of the guests at our Sandwich inn to walk across the street and spend some time at the Sandwich Glass Museum.